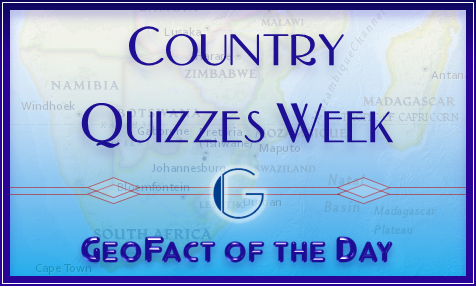 During the week of Monday, February 27th to Sunday, March 5th, GeoFact of the Day is hosting a Country Quiz Week. 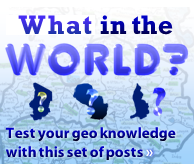 Every day or every other day, there will be a new quiz on a particular country around the world. Want to see a post about a favorite country? Feel free to share your suggestion by posting a comment! See if you can answer these questions pertaining to TAJIKISTAN without the help of literary resources and the Internet. Answers are provided at the end — Good Luck! 1) Believed to be the world's highest dam with a 300-meter tall barrier, the Nurek Dam was completed in 1980 and straddles which of the following rivers? 2) The national cuisine of both Tajikistan and UZBEKISTAN borrow extensively from Persian cooking. Indeed, the national dish of both countries is pilaf (plov). Qurutob is another national dish of Tajikistan. What basic ingredients does this meal have? 3) According to the UNESCO Institute for Statistics (↗), the literacy rate for young people (ages 15-24) in AFGHANISTAN is estimated at 58%, while the adult rate is only 27%. Meanwhile, the percentage of people who can read, write, and communicate in neighboring Tajikistan at all ages is over __________________. 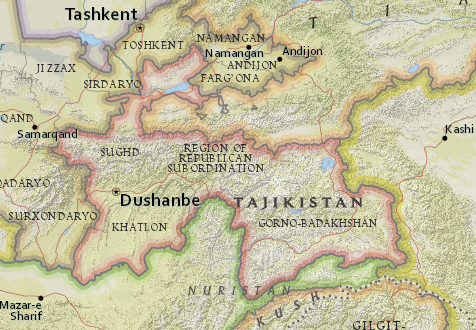 4) What country does not share a border with Tajikistan? 5) True or false: One of the largest lakes in Tajikistan is Kairakum Reservoir, which translates to Қайроққум обанбори in Tajik and Kayrakkumskoye Vodokhranilishche in Russian (Latin version). This lake is located in northern Tajikistan's "panhandle" area.